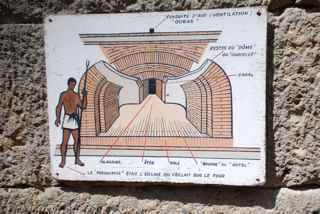 Rae's Nomady: What did the Romans ever do for the French? 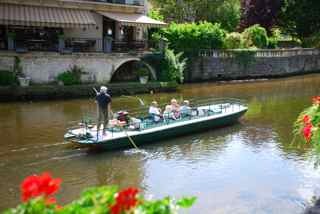 And Brantome. What did the Romans ever do for the French? 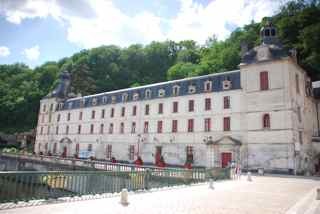 And Brantome. 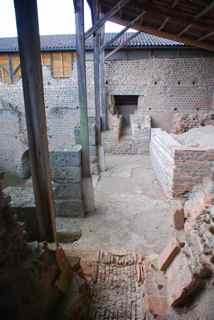 This morning is a visit to Cassinomagus - not an gambling wizard but the local Roman capital. 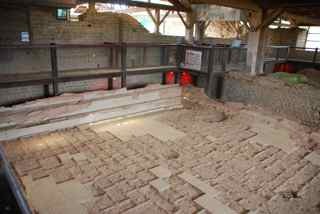 There are still the remnants of their baths open to visitors, complete with recently refurbished visitor centre. It was almost completely empty of visitors, which was heaven for me, but a real shame since it's an awesome place and well laid out with educative gardens demonstrating all the plants used by Romans. 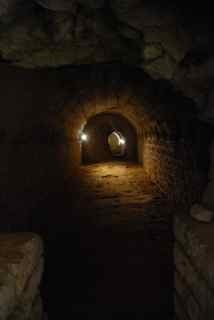 Situated on the Agrippan Way (Lyon - Saintes), Cassinomagus was, in the Roman times, important enough to be mentioned on the mediaeval Peutinger map as one of the two secondary towns between Limoges and Saintes. 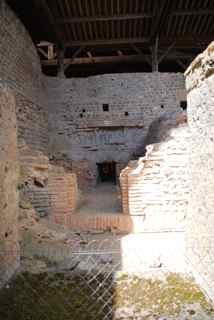 The remains of this Gallo-Roman town lay on about 300 hectares and include a sanctuary of about 25 hectares. 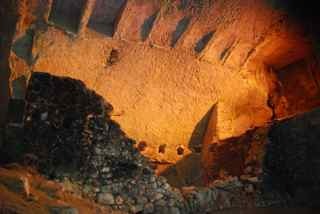 This sanctuary consisted of several monuments: a big temple, two small ones, a theatre (amphitheatre ? 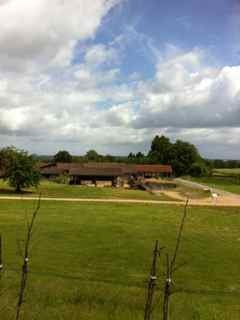 ), and thermal baths. 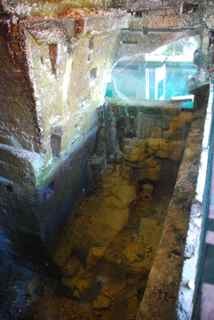 The baths, which are very well preserved, can be visited. The text may be a bit small on this sign - but the french 'latin name' tickled my sense of humour - one for Janine I think! 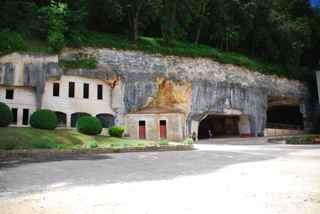 From Cassinomagus, onto Brantome and the start of the subterranean and rockface dwellings. 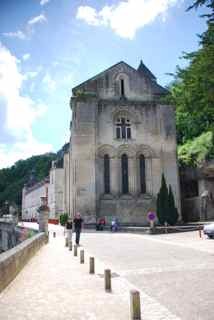 Brantome boasts a beautiful Abbey which was built into the rock face. However, prior to exercise and walking, I partook of a pleasant cafe au lait by the river and observed the French style of 'punting'. Now, for those of you that know me, I'm a Cambridge girl, and I believe in punting from the back of the boat, and not the front, and definitely in punting from the boarding and not safely ensconsed in main body of the boat. That said, even Oxfordians get my vote over this - punting with an outboard motor for propulsion just isnt punting!! 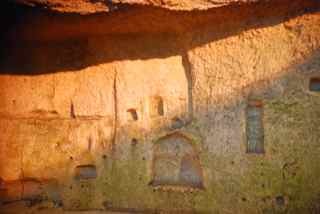 The abbey tour consists in the majority of the old monastic dwellings carved into the rock face. 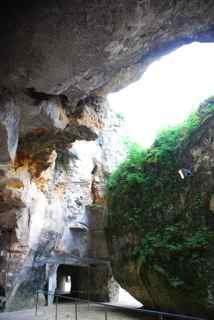 It is impressive, but well, it's rock. 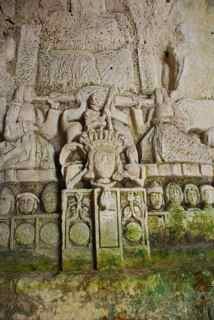 Until you walk into the main room and see the awesome carvings of deities and devils carved across the walls. In the main storage rooms, the ever adventurous Tourist Information office has converted it into a ......wait for it.......salmon breeding farm! Complete with pens, fish and illustrutive imagery, you are educated into how to strip the milt from salmons, fertilise thousands of eggs in one go, and the average growth curve of salmon in salmon farms! 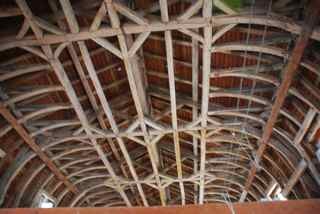 Within the main building you are allowed limited access to a number of rooms : this is the most awesome beamed ceiling I've seen in a while. The church attached is pleasant and cool on a sunny day, but only the clock tower remains in it's original medieval state, the rest having been frequently reworked over the years.